At the time of launch, many Nexus 5X owners noticed that their device's display was appearing a bit too warm, or yellow. The only remedy for this issue was to exchange the device for another, but that didn't guarantee the next device's screen would be any better than the previous one. Step 1: Make sure your device is up-to-date by checking Settings > About phone > System update. You'll need to be on build number MHC19J (listed at bottom). Step 2: Enable developer mode by repeatedly tapping the Build number in the Settings > About Phone menu. 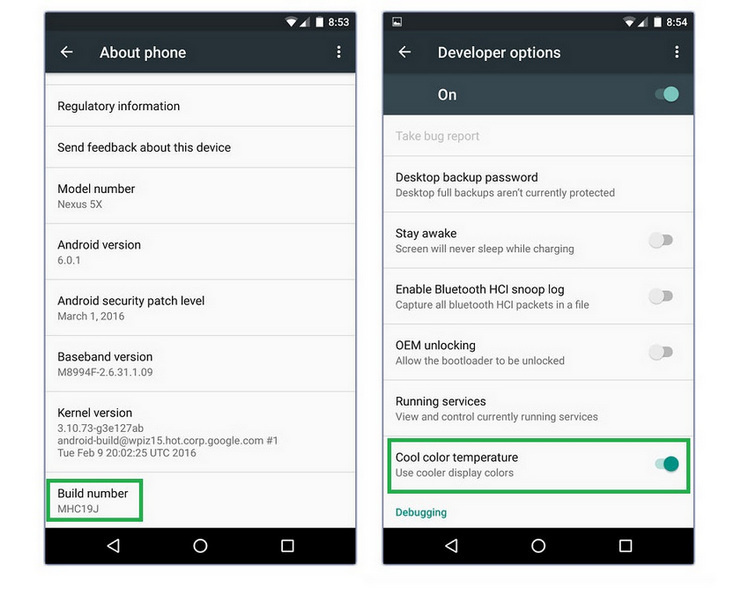 Step 3: Head to the Developer Options in the Settings menu and toggle Cool color temperature. You'll need to turn the display off and back on for changes to take effect. The addition of this option means that Google is truly listening to feedback from users. While some Nexus 5X owners exchanged devices until they found one with a color temperature they could accept, now a solution is available in the device menu.